A place to share all of our TSFL recipes, tweeks, tips and ideas! Combine all ingredients except the diced tomatoes and water in a bowl until combined. Form balls from the meat. Put diced tomatoes and water in small saucepan over medium heat until heated thoroughly. I like to use a fork and smash the diced tomatoes so it resembles a chunky marinara sauce. 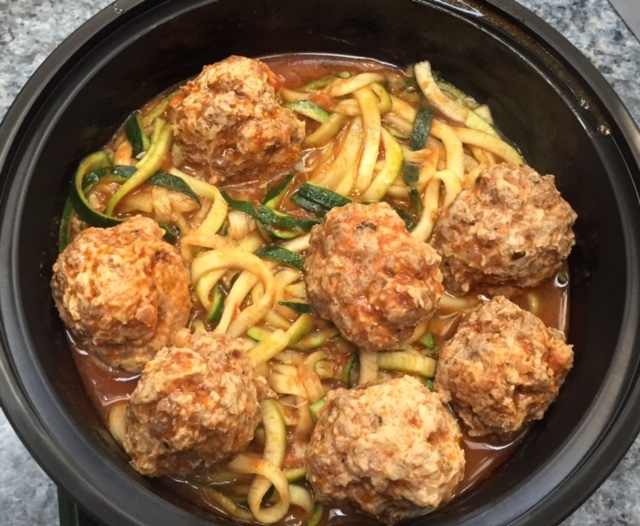 The slowly put each meatball in the sauce and let it boil uncovered for 15min or until meatballs are cooked thru. Serve with 1 cup spaghetti squash, zoodles or shiratake noodles for your additional 2 Greens. Hi! I wasn’t able to find diced tomatoes that had less than 5g carbs per 1/2 c serving. Can you tell me what company/brand you used? Hmm. I was looking at all the Hunt’s cans but they were all more than 5g. I’ll check a store like ShopRite for greater selection. Thank you!